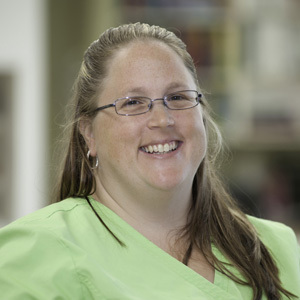 Christine has an Associate degree in general studies and veterinary technology (2001), and is a Licensed Veterinary Technician. She has over 12 years emergency and critical care and day practice experience. Christine is working towards her veterinary emergency speciality certification, and finishing her certification for canine rehabilitation and physical therapy. "I love that I am able to help animals in their time of need, by using the skills I have been taught over the years as well as new techniques learned through my co-workers and continuing education". Christine has 4 cats: Stevie Wonder (Cerebular Hypoplasia), Hop-along-Cassidy (3 legged), Dru, and Ody. She also has 2 dogs: Zariel and Zukie.